Hove is a stunning resort along the coast offering a wide range of things to do from exploring Hangleton Manor to going for quiet drink with over 30 pubs you are spoilt for choice. Hove has the plus of being on the coast so you can also explore its seafront and it has lots of restaurants. Taste the cracklin hog roast want you to have a pleasurable experience so besides the set menus we also do individual menus. For those who think that a hog roast is just pork we have a pleasant surprise we also use anything from chicken to beef or kebabs. You can contact us by using the query form on the website or by phone we aim to reply to most queries within 24 hours. We will then discuss the menu over a tea or coffee so we get everything right first time we pay attention to detail and are well known for this. Taste the cracklin hog roast have been in the business a long time and this coupled with are outstanding chefs and waiting on staff makes us a good choice. For the wedding menu we offer the hog roast Hove sandwich accompanied by condiments such as stuffing or apple sauce suitable for team building events or a breakfast for a wedding. From the wedding menu we offer 4 courses including canapés and desserts which can include champagne before and a bar all night. We also offer a vegetarian option or fish if required an example of a menu would be; for example lamb with rosemary and condiments, a vegetarian option if required, bread rolls, sauces, salad or vegetables, maybe roast potatoes followed by wedding cake served on a plate with fresh cream includes crackling. 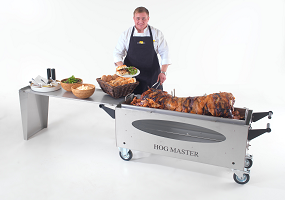 Tastethecracklin hog roast hire Hove also recognize that some people may want to cook their own hog roast hove food and we have two machines one larger and one smaller. Each machine is CE marked, regularly tested so it meets health and safety standards. The machines can also spit roast and can cook a whole animal or a part and are versatile in that they can cook a range of meat including chicken through to lamb. Taste the cracklin hog roast hire Hove deliver, demonstrate and pick the machine up afterwards and as it is an easy cooking process which keeps the meat succulent the machine can be left so you can mix with your guests, Another advantage is that it has an oven so you can cook vegetables too and if you want we can also supply the meat. Flossie wanted something different for her sixtieth so she had a hog roast. Hi I am Flossie yes I used tastethecracklin they were great I had menu 4 a hog roast Hove, with a choice of 3 salads rolls, new potatoes and buttery with all the crockery. It was great the hog roast was almost like s centrepiece I picked beef and it was so juicy it was delicious. My sister-in-law picked a salad the portion filled her up and I even got my beau Alex up and dancing. The chef was lovely and explained the cooking process to me and my friend Angie had 3 servings the atmosphere was great and the staff cleared up afterwards it was money well spent. See you later. If history is your thing there is Hangleton Manor the original house what remains of the buildings now is the Hangleton Manor pub originally dates back to 15/1600s. It is now a carvery and there is Hove Museum and Art Gallery which house artefacts including toys. For the children you could do no better than Westows an indoor play area including a softplay area, football pitches and a restaurant that caters for up to twelve years a plus is that you only pay one price, babies and adults are free. British Engineerium houses steam trains and is found on Nevill Road and how about the Iron Duke pub built at the beginning of the nineteenth century. At the weekend there is a DJ. If you are, a real ale fan this is the place for you as it is Casque Marque accredited. Fancy something different how about a walking tour of Hove like things can go bump in the night try the Blue Anchor pub. In the early nineties a bar person heard ‘Door! Door!’ He turned around just in time to stop the door from locking. In the Hangleton Arms Inn there is more than one ghost we look forward to seeing you soon.